You’ve made a great decision to consider a whitewater rafting adventure on the river this year, but you need to be properly prepared to ensure you have the best trip possible. Some pointers may seem obvious to the established adventurer, but it’s good to cover all ground and be sure you aren’t missing anything before your excursion. Here’s our packing list of everything you need on a whitewater trip. Closed toed shoes are the go-to option for footwear, since it’s nearly impossible to lose one in the water. Some open-toe footwear like Chacos will work since they are strapped on fairly tight, but skip the flip flops, crocs, and sandals. Whatever is on your feet needs to be able to stay on your feet just in case you go for a swim. Old tennis shoes you don’t mind getting wet are usually the best option for people that don’t have water specific shoes. If you book a trip with AVA Rafting & Zipline, we’ll provide a wetsuit and splash jacket to you free of charge so that can be scratched off your list. The water in Colorado is cold year-round so these are essential to keep a smile on your face the duration of the trip. What’s just as important as a wetsuit and splash jacket is what you wear under it. A bathing suit and athletic shorts work great under this gear, or any synthetic athletic material like Under Armor or Nike Dryfit. The main rule is to not wear cotton! Cotton will get wet and stay cold under you are able to take it off to let it air dry. If you find yourself in the water at the beginning of your trip, the rest of the day will be a bit frigid. Sunscreen is always a good idea, for some river trips you may be in direct sunlight for hours. Sunglasses can also be useful, but be sure to have some Croakies so you don’t lose them to the river. If you’re one who loves documenting your adventures, GoPros work best with a waterproof casing and solid mounts. Another thing to bring is some water and snacks. The rafts are limited in space and what can be brought on, but usually the guide will have a dry bag to throw some things in for you. You can also have a water bottle with you if it has attachments that will let you secure it to the boat. 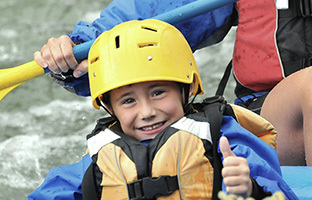 Venture out with AVA Rafting & Zipline and the rest of the gear is covered for you. Helmets, paddles, & PFD’s (Personal Flotation Devices) will be given to you at the outpost before you set off for your trip. Most outposts also will be able to provide you with photos and videos of the trip as well. Set yourself up for an amazing day on the water!